We all are aware that our home is powered via an electrical service panel, the electrical distribution point. This panel could be located in the basement, garage or an interior utility room in your home. Sometimes homes are large and strung out and require additional electrical panels to supply power to different areas of the home. This is where a sub-panel comes in handy. Sub-panels are smaller in amperage size than the main electrical service panel. For instance, you may feed the home with a 200-amp panel and a new addition that is fed with a 100-amp panel. Sub-panels are fed with a single feed from the main service panel via a breaker rated high enough to handle the load required for the area that it will feed. You should always allow space and make the feed large enough for future growth. There is always the possibility that the main service isn’t big enough itself for such an addition. In that case, a service upgrade should be in your plans before adding a sub-panel. Typically, you’ll have a 100-amp service and a 60-amp sub-feed or a 200-amp service with either a 60- or 100-amp sub-feed for additional areas of the home. If your home is really old, you may only have a 60-amp service, to begin with. In this case, especially, you need to upgrade to a larger service. 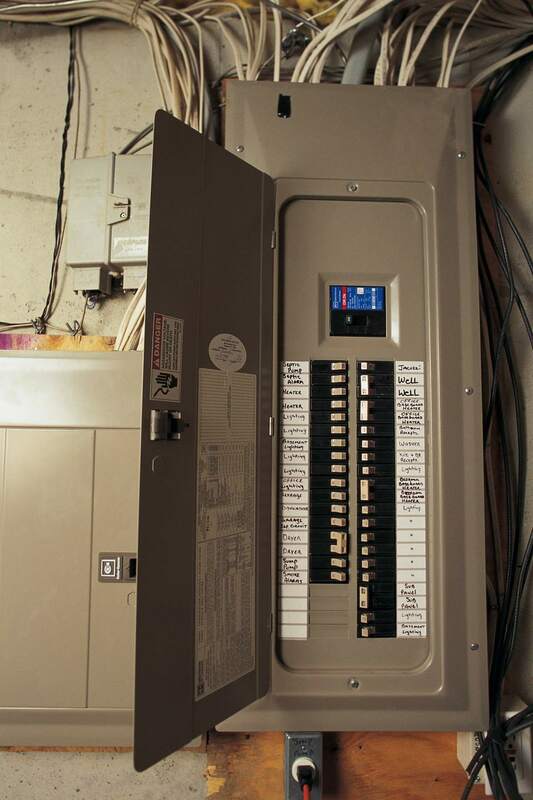 Try replacing the electrical service with a circuit breaker panel that has many circuit breaker openings, at least 20-30 openings is a good choice, depending on the number of circuits needed in your home. Once sub-panels are fed from the main service panel, they are ready to distribute their power but are protected from the breaker in the main panel that they are connected to. From there, the sub-panel distributes power, just like the main service panel, via individual circuit breakers. These breakers protect the circuits at a predetermined amperage value that is posted on the breaker switch face. Common sizes include 15-, 20-, 30-, 50-, 60-, and 100-amp breakers. There are more values for breakers, and the nameplate rating of the device that you need to connect to will dictate the value that you choose. Generally, you’ll find this tag on the back or near the electrical connection on the device. Sub-panels are great for different areas both in the home and outside the home as well. Locations could be different levels of the home, garages, tool sheds, and other outbuildings where you need multiple circuits. My home has two different sub-panels, both in the shed and a small storage building as well, and it makes extending circuits so much easier. By using a sub-panel on each level of your home, you will be able to connect that floor of the home up to the panel on that floor. The advantage is that if a circuit breaker trips or you want to shut off power to a circuit, it's right there on the same floor as you are. So, let’s review sub-panels. We now know that there is no need to run any wires from your existing panel all the way across the home to a new addition when we can install a sub-panel to accomplish the same task and save on the cost of wire. We also learned that sub-panels are fed from the main service panel and are smaller in amperage than the main. Sub-panels are protected by the breaker feeding it in the main panel, and the sub-panel has its ​circuit breakers to feed and protect the circuits in the area it will feed. All-in-all, sub-panels are a great addition to supplying power to additional areas of the home. Whether it’s a garage, room addition, basement, utility shed, or barn, sub-panels can do the job of supplying power where it is needed. Are you in need of a sub-panel in your home?